Blaze destroyed new home under construction in the wee hours of Wednesday morning. 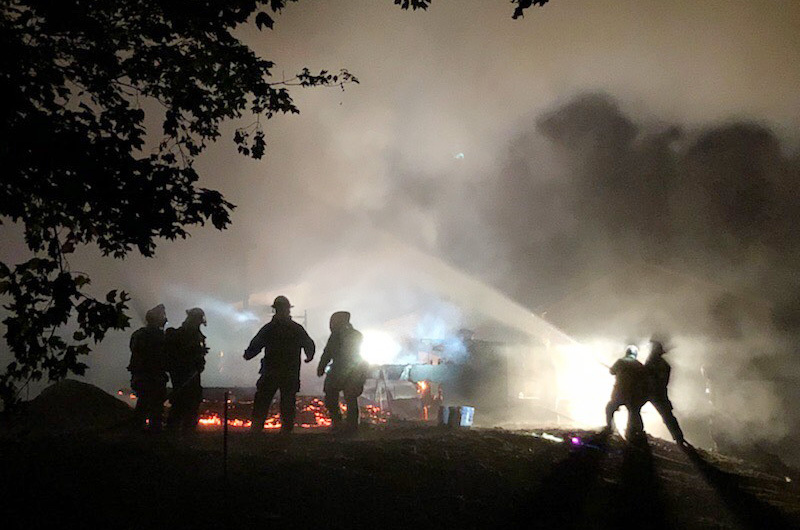 A home under construction on Middle Road in Chilmark caught fire early Wednesday morning, engulfing the property in flames for nearly two hours and prompting an all-out mutual aid response from every Island fire department. Firefighters were still on the scene containing hots spots early Wednesday afternoon. The construction site was unoccupied and there were no injuries. Chilmark fire chief David Norton said the blaze was apparently caused by oil-soaked rags left on a back deck. Chief Norton received a call at 3:43 a.m. from Richard and Patricia Bennett, who live behind the property on Dilley Way and whose dogs alerted them to the blaze. According to the Bennetts and Chief Norton, the fire started on the back deck of the house and rapidly spread into the building only minutes after they made the call. By 4 a.m, the flames had reached upwards of 30 feet into the night sky. 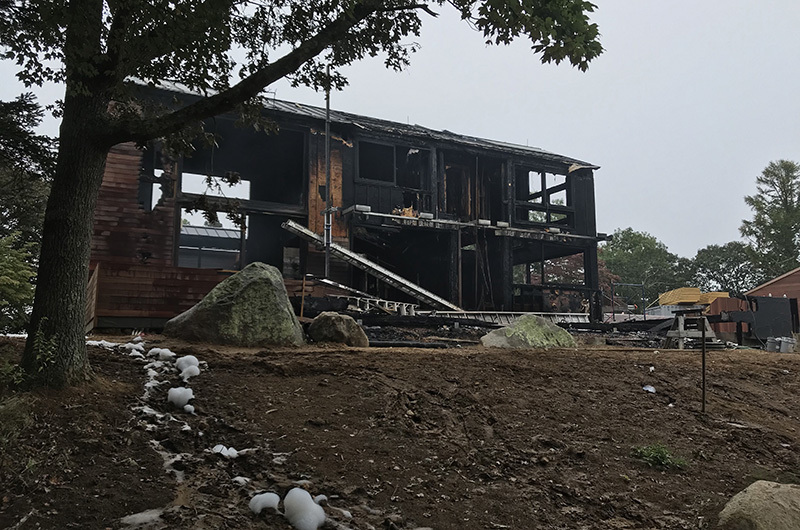 Chief Norton alerted the Chilmark, Aquinnah, and West Tisbury fire departments, who arrived on the scene a short time later. Seven trucks and nearly 30 firefighters shuttled water from a pond adjacent to Chilmark Chocolates in an attempt to quell the flames. By 4:30 a.m., the fire had died down, leaving a cloud of smoke, ash and destruction in its wake. Firefighters continued to battle stubborn pockets of orange sparks and patches of flames until long past dawn. “It started lapping up the walls on the outside,” Chief Norton said, “and it broke all the windows on the outside of the house. It’s a funnel, and all the heat and flames proceeded to destroy the inside of the house too." The high humidity, misty precipitation, and lack of wind prevented the fire from wreaking havoc on nearby properties. But the backside of the construction site suffered serious damage, appearing gutted from the inside and charred from the out. According to neighbor Helen Neumann, the property belongs to Bethany Newell, who tore down the previous building two years ago and undertook an extensive construction project with Hutker Architects to build a state-of-the-art, LEED-certified home on the land. Ms. Neumann said the project was near completion. Chief Norton couldn’t remember the last structure fire in Chilmark. By midday, five of the Island’s six fire departments had responded, with Oak Bluffs and Edgartown joining the up-Island departments. The Salvation Army brought the firefighters food and water throughout the day. “It was a well-oiled group that assisted,” Chief Norton said. A few firefighters were still on-scene as of 1 p.m., helping Chief Norton put out the remaining hot spots. Chief Norton also said he will not request an investigation from the state fire marshal because he had spoken with the contractor Clancy Construction and corroborated that the cause was the oily rags left by subcontractors.